In an attempt to diversify Newfoundland and Labrador's economy into areas other than the cod fishery, government officials promoted various land-based industries during the first half of the 20th century. Most successful among these were the forestry and mining sectors, although agriculture also grew in importance. The construction of the railway in the late 1800s and of branch lines in the early 1900s facilitated the development of land-based industries by making the island's interior more accessible than ever before. 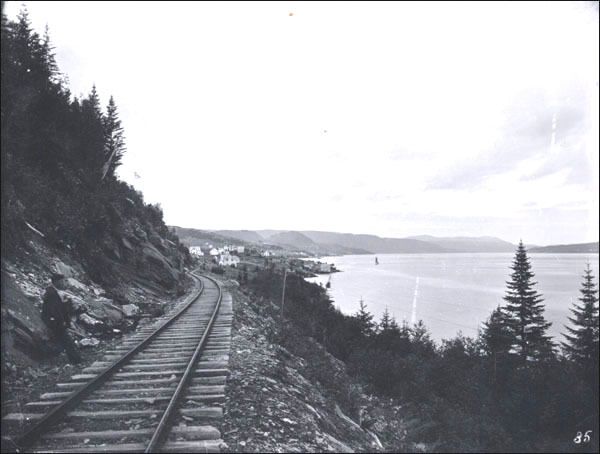 Construction of the Newfoundland railway opened up island's interior and made it easier for government and business officials to exploit the region's natural resources. Photographer: S.H. Parsons. Reproduced by permission of Archives and Special Collections (Coll. 137 16.01.003), Queen Elizabeth II Library, Memorial University of Newfoundland, St. John's, NL. By the start of the Second World War, new mines and mills dotted the country's interior and coast. These in turn gave rise to a variety of new settlements, including the paper town of Grand Falls and the mining town of Buchans. While foreign investors owned much of these new ventures, Newfoundland and Labrador had acquired a more diversified economy, which depended on three resources instead of just one. Although sawmills existed in Newfoundland and Labrador since the 1600s, railway construction gave the industry renewed importance by increasing demand for lumber and by making inland forests accessible. Throughout the 1890s, operators built mills or established logging communities at Botwoodville, Norris Arm, Glenwood, Millertown, Terra Nova, Benton, and various other locations along the railway. A Nova Scotian business, the Grand River Company, also established a mill at Mud Lake in Labrador and began logging operations there. 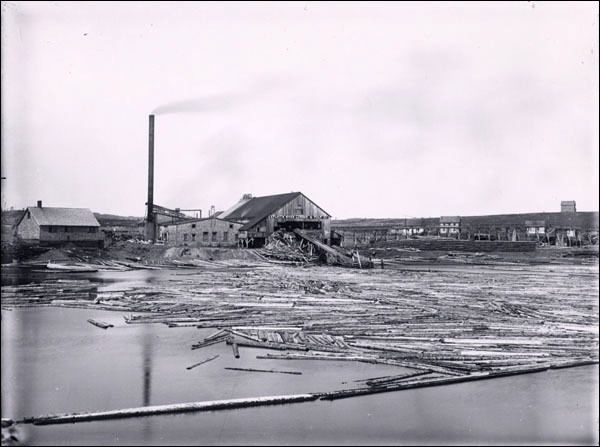 Newfoundland and Labrador's first large-scale sawmill was built at Botwoodville (now Botwood) in 1890. Photographer unknown. Reproduced by permission of Archives and Special Collections (Coll. 137 20.03.002), Queen Elizabeth II Library, Memorial University of Newfoundland, St. John's, NL. By 1901, Newfoundland and Labrador boasted close to 200 sawmills that employed 2,400 workers. The country was exporting up to 50 million board feet of lumber each year, much of which was white pine. Years of intense harvesting, however, caused white pine to become depleted before the First World War and the sawmilling industry fell into decline. Fortunately, a burgeoning pulp and paper industry, which used black spruce, balsam fir, and other varieties of softwood, created much employment for loggers and millworkers. Like sawmilling, the pulp and paper industry expanded after the railway made previously unexploited forests accessible to logging operations. In 1909, the Anglo-Newfoundland Development (AND) Company opened a pulp and paper mill on the northwest bank of the Exploits River. It established the paper town of Grand Falls to accommodate mill workers and by 1911, 1,634 people lived at the site. The company also acquired rights to forest lands at Badger and began logging operations there to supply the Grand Falls mill with lumber. As a result, Badger also experienced rapid growth in the coming years. Following completion of the Grand Falls site, other mills also appeared on the island, but met with varying degrees of success. In 1911, Albert E. Reed and Company opened a pulp-wood mill about 16 kilometres downstream from Grand Falls; this gave rise to the town of Bishop's Falls. In 1932, the company sold its mill and timber rights to the AND Company, which continued producing pulp at the Bishop's Falls site until 1952. 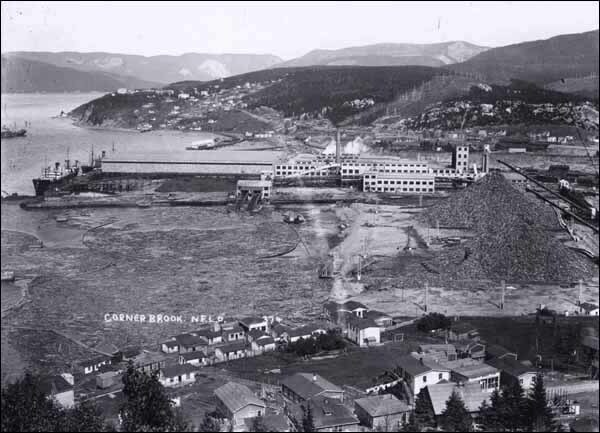 In 1914 the Horwood Lumber Company established a mill at Campbellton in Notre Dame Bay, but halted operations a year later after the main dam on Indian Arm Brook failed. The Terra Nova Sulphite Company Limited began building a paper mill at Glovertown in the 1920s, but ran out of money before finishing construction. The company sold all its mill buildings and timber rights to the AND Company in 1923, which began shipping Glovertown wood to its Grand Falls mill. The Reid Newfoundland Company, with help from other financial backers, established a large and successful newsprint mill near the Humber River in 1925. Alongside building the mill, the company also established a townsite for millworkers, which became known as Corner Brook. To supply power to the mill, the Reid Newfoundland Company established a hydro electric station at Deer Lake, which attracted permanent settlers there for the first time. The Reid Newfoundland Company established a successful newsprint mill near the Humber River in 1925. Photographer unknown. Reproduced by permission of Archives and Special Collections (Coll. 137 16.03.001), Queen Elizabeth II Library, Memorial University of Newfoundland, St. John's, NL. Although the Corner Brook mill's ownership changed over the years – the International Paper Company bought it in 1926, Bowaters took it over in 1938, and Kruger Inc. acquired it in 1984 – it remained an important part of the Newfoundland and Labrador economy and is still in operation today. Newfoundland and Labrador's mining industry also expanded the late 19th and early 20th centuries. This was largely due to advances in transportation and mining technology and to the government's support of resource development, which it hoped would bolster the economy and create jobs for a growing population. The first major mine opened at Tilt Cove in 1864 after prospectors discovered large copper deposits and traces of gold there in 1857. This mine, which remained active until 1917, was followed by a string of other, much smaller, mining operations at Notre Dame Bay on the island's northeast coast. Copper mines opened at such places as Terra Nova (1860-64, 1902-06, and 1910-15), Bett's Cove (1875-86), Little Bay (1878-94, 1898-1901, and 1961-68), and Pilleys Island (1887-89, 1892-99, 1902-08). However, a sudden drop in copper prices on the world market in 1907-8 brought Newfoundland and Labrador's copper boom to an end. Newfoundland and Labrador's first major mine opened at Tilt Cove in 1864. Photographer unknown. Reproduced by permission of Archives and Special Collections (Coll. 137 13.06.001), Queen Elizabeth II Library, Memorial University of Newfoundland, St. John's, NL. The opening of the lucrative Bell Island iron ore mines in 1895 helped offset the declining copper industry. These mines employed hundreds of local workers and helped establish the mining town of Wabana. Two Nova Scotian companies – the Nova Scotia Steel and Coal Company and the Dominion Steel Corporation – owned the operation for much of its existence. By the time the mines closed in 1966, they had produced approximately 81 million tonnes of iron ore, most of which was exported to Nova Scotia and Europe. Ten years after the Bell Island mines opened, rich mineral deposits surfaced near the Buchans River in central Newfoundland. In 1905, the AND Company acquired exclusive timber, water and mineral rights for 99 years to 6,000 square kilometres of land surrounding the Red Indian and Victoria lakes. Although the company was primarily interested in the country's forests, it also hired a prospector to search for any mineral deposits in its holdings. 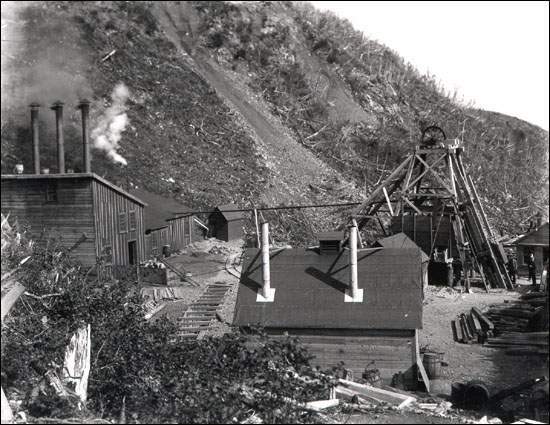 Despite finding zinc, lead, copper, gold, and silver in 1905, the AND Company did not begin mining operations until 1927, when technological advancements allowed workers to separate the minerals. It also established the town of Buchans to accommodate employees. Before the mine closed in 1984, it produced approximately 17.5 million tonnes of ore, which included 3.8 million tonnes of zinc, 1.8 million tonnes of lead, and 580,000 tonnes of copper. The Dominion Steel Corporation (DOSCO) of Sydney, Nova Scotia opened a limestone quarry at Jack of Clubs Cove on the island's west coast in 1912. The company also established the mining town of Aguathuna to accommodate workers. DOSCO continued operations at Aguathuna until 1966, when it closed the mine and sold all holdings to the government for $1,000. Another major pre-Confederation mine was the St. Lawrence fluorspar mine, which the American-based St. Lawrence Corporation of Newfoundland opened in 1933. By the time the mine closed in 1977, it had produced over 4.2 million tonnes of fluorspar, a mineral used in the manufacture of aluminum, glass, enamels, refrigerants, and other materials. The mine reopened in 1982 before closing again in 1990. Although the operation provided employment for hundreds of workers, many became ill and some even died following exposure to radioactive radon gas and silica dust in poorly ventilated shafts. Agriculture also expanded in the half-century leading up to Confederation, but it failed to achieve the same level of economic success the forestry and mining industries did. Commercial farmers in Newfoundland and Labrador had to overcome a number of obstacles – the country's rough terrain made clearing new land difficult and expensive, the climate and acidic soil favoured only a small variety of crops, and a scarcity of local markets made it difficult to earn a profitable living. Nonetheless, various government administrations between the late-19th and mid-20th centuries tried to encourage agriculture in an attempt to diversify the economy and provide supplementary income for the public. The Responsible Government offered cash incentives in the 1870s and 1880s to help farmers buy and clear new lands, while the Commission of Government devised a land settlement scheme during the Great Depression to stimulate agriculture. Under this program, the Commission created several new farming settlements at such places as Markland, Brown's Arm, Lourdes, and Midland before dismantling the costly project in 1941. The government also established a Demonstration Farm and Agricultural School near St. John's in the mid-1930s to help educate future farmers. The growth of new populated centres at Grand Falls, Corner Brook, Buchans, and other regions following the construction of the railway also created new markets for local farmers outside of St. John's. However, farming in Newfoundland and Labrador continued to occur largely on a subsistence level instead of evolving into an industry in its own right. According to the 1935 census, only 4,339 people worked as farmers, but 35,469 people cultivated some land while working in the other occupations.